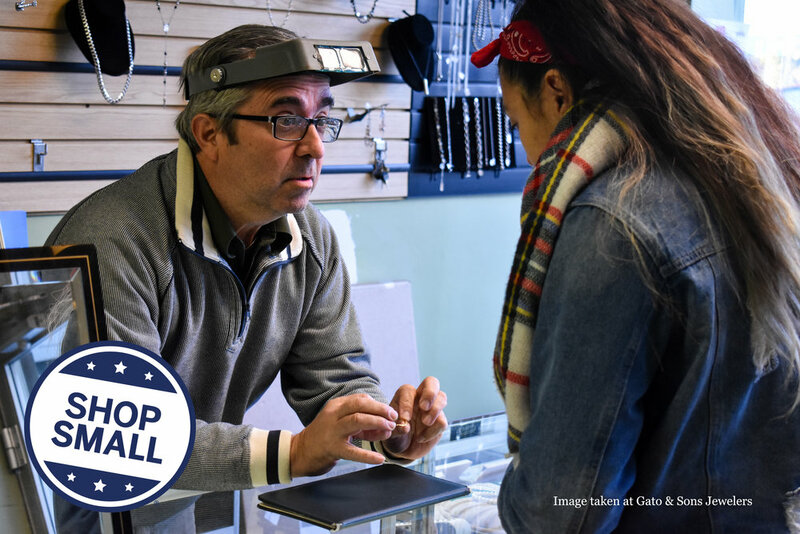 Skip Black Friday and Cyber Monday and instead #ShopSmall this holiday season! Supporting local businesses keeps money within our community and helps us grow. Besides, we’ve got plenty of options right here! Leading up to Small Business Saturday— taking place Saturday, November 23— and all the way to Christmas, Six Corners businesses are serving up the coolest deals and holiday offers so that you can not only treat every one of your loved ones, but also yourself! Gato & Sons Jewelers, 4849 W. Irving Park Rd. About: Everyone’s father has a drawer full of watches that they can’t wear for one reason or another. Why buy them a brand new watch when you can get their favorite ones fixed! Owners Jose & Alex have operated this shop for decades and can meet all your jewelry and watch repair needs. Jesse’s Barbershop, 4851 W. Irving Park Rd. About: “We are unique in the sense that we provide an atmosphere and service from days gone by.” says owner Jesse. The instant you walk in their men’s only barbershop, you’ll see exactly what he means. With classic black and white tiling, and chairs that’ll make you feel like you’re in an old timey movie, Jesse’s Barbershop is a father’s favorite. Mobile Audio & Alarm, INC., 4101 N. Milwaukee Ave.
About: Mobile Audio & Alarm is pleased to offer same day service and service while you wait 7 days a week. How much would your father enjoy being able to start his car from inside the house and have those seat warmers going before he even gets out into the Chicago snow? This is a wonderful gift. Wildlight Yoga, 4140 N. Milwaukee Ave.
About: “We are an adventure-inspired yoga studio offering 35 yoga classes per week,” says owner Kelli Wefenstette. Think that a yoga studio isn’t a very masculine space? That doesn’t matter here at Wildlight Yoga, where travel and a spirit of adventure are at the heart of all of their practices. So men, feel WELCOME here, because you absolutely are. Culver's, 4939 W. Irving Park Rd. About: “We serve Butterburgers and frozen custards with outstanding Midwestern hospitality,” says owner Danny Ehle. Never had one of Culver’s frozen custards? It doesn’t MATTER what the season is- your dad is sure to enjoy this meal. Fischman Public House, 4058 N. Milwaukee Ave.
About: “We are a family-owned business that takes pride in being involved in our community through special events and local business collaborations,” says co-owner Shanna Karamaniolas. A gift certificate to Fischman's means your dad can stock up on the local brews he loves best. Distinct Bath and Body, 4046 N. Milwaukee Ave.
Offer: Gift Trio Sets available for purchase. About: “We offer handcrafted soaps and other all natural bath and body essentials,” says co-owner and soap craftsman Sam. Distinct offers everything from soap bars to shampoo bars to bath bombs and all of their products are made to be as friendly to different skin types as possible. If you have any questions about what goes into their products, their detailed ingredient labels are helpful, but Sam and his staffmembers can be even more friendly and helpful! Edible Arrangements, 4333 W. Irving Park Rd. Offer: Buy one get one free dipped fruit boxes. About: “We make fresh fruit arrangements and dipped fruit boxes for all occasions,” says Anita Bustos of Edible Arrangements. We’ve seen firsthand how beautiful their arrangements are, but better than that- they’re DELECTABLE! Fly Girl Dance & Fitness, 5525 N. Milwaukee Ave.
About: “We are all about #GirlPower - women supporting women!” says Kymberlee Kaye Raya, owner of Fly Girl Dance. She is one of the most vibrant and energetic people we’ve ever met, and her teachers and trainers embody that very spirit. Fly Girl has become a real place for female togetherness and empowerment, as well as a wellspring of community involvement. A membership will get you much more than just fitness classes; it’ll also get you friendships! The Beauty Crew, 4048 N. Milwaukee Ave.
About: “Permanent makeup is our focus, but we also offer creative hair styling and stunning makeup applications. Our space feels more like a ladies lounge than a traditional salon. We are music lovers and positive “vibers”, so it’s not unusual for our clients to become our friends,” says Lisa Pizzello, owner of The Beauty Crew. The Beauty Crew definitely employs a ‘give a person a fish’ mentality, offering a variety of beauty services, as well as instructive workshops and full courses at their Beauty Crew Academy. The Yoga Shop, 3880 N. Milwaukee Ave.
About: “We are a community-based independent yoga studio,” says James Cogan, owner of The Yoga Shop. They offer a number of hip yoga classes such as warm & hot sessions, restorative, and vinyasa flows. The Yoga Shop was one of the pioneers of yoga on the northwest side of Chicago, so they’re pretty important to us! Tatas Tacos, 4929 W. Irving Park Rd. About: “Everything is made in house. We make our tacos fresh - they are cooked to order. Most specially, we make our tortillas by hand,” says Marci Berner, owner of Tatas Tacos. Marci and her team are dedicated to providing the most innovative slate of tacos on the northwest side and to that vision, they recently released a huge new menu of tasty offerings. Believe us when we say, your mom’s going to love being treated to some Tatas! Brother’s Hair Design, 4902 W. Irving Park Rd. About: “We’ve offered 25 years of professional haircuts and great styles. We also specialize in fixing bad haircuts from other barbershops,” says Baker Shakar. That last piece- that might be especially helpful to you. But, in general, Brother’s just updated all of their equipment and supplies and they are your place to go to treat yourself during your holiday shopping or in preparation for your festivities. Luxe Blue Laser and Med Spa, 4016 N. Milwaukee Ave.
Offer: 25% off nail services, $29 for facial Microdermabrasion, $60 for pumpkin peel or detox (reg $99) red carpet glow, $40 for one session of lip or chin laser hair removal, $80 for one session of underarm laser hair removal. About: Luxe Blue is a cute boutique that offers custom facials and peels for all skin types. They also specialize in laser hair removal and nail services. Talk about treating yourself! Get your nails done, get your face peeled, and be glowing and ready for your holiday festivities with Luxe’s professional team of experts. Prism Optical Chicago, 3594 N. Milwaukee Ave.
Offer: Free anti-reflective upgrade on all lenses purchased including 1-year scratch guard warranty at no additional cost. Some restrictions apply. About: “What sets us apart is our specialized optical service, attention to details and our on-site optical lab technician with over 30 years of experience. We have been family owned since 1991,” says Darlene of Prism Optical. We’re all always putting off getting ourselves new glasses- why don’t you upgrade this holiday season and enter 2019 as your most fashionable, four-eyed self yet? Today's Avon, 4057 N. Milwaukee Ave.
Offer: Spend $40 and get a special Avon gift box for $10. About: “We have a wide selection of items for skin care. There is no need to wait for shipping as items are ready to be purchased and go home with you on the same day. Products are also available for testing,” says Rossy, longtime owner of Today’s Avon. Walking into the shop will be a treat in itself, as even in these dreary winter days, the shop is bright and cheery. Owner Rossy is extremely friendly and helpful and in addition to giving you tips on the best gifts in the shop, she can tell you what you need to up your skincare game. SoundBite Coffee, 4255 N. Knox Ave.
About: Professional music and film/video ecosystem SoundBite Coffee offers real deal classic subs, totally from scratch Sicilian Schiacciata, salads and snacks alongside their coffee. They feature local vendors and many Chicago-based brands. Their Astoria espresso machine is custom-painted by Jason Brammer and it brews Unicorn Blood beautifully! Head over here to get out of the cold and treat yourself to some delicious (and eclectically titled) coffee. Shilas, 3938 N. Cicero Ave.
About: “Shila’s offers fresh food—never frozen—and all natural and organic ingredients. All orders are prepared to order every day. Customers are treated with the highest priority and with a personalized experience,” says Manny Romero of Shilas. What we know you should treat yourself to, though, is their fluffy French toast. But you really can’t go wrong with a Shilas brunch. Collectiv, 5743 W. Irving Park Rd. About: “Collectiv is a carefully curated collection of local artists, crafters, designers, and makers. From unique jewelry to handcrafted candles, you can surely find something for everyone. We have new products arriving monthly from various local artisans and makers, so you’ll always find something new, plus a few vintage items!” says Lilia of Collectiv. She’s pretty much summed it up, but we’ll add that we appreciate Collectiv’s emphasis on Chicago-made products. That’s what we’re all about, after all! Community Tavern, 4038 N. MIlwaukee Ave.
About: “We are a New American restaurant owned and operated by husband and wife team, Joey & Brenna Beato. Our dream has always been to run our very own elevated 'mom & pop' restaurant in the neighborhood we call home. Chef Joey combines seasonal, local midwestern ingredients with pan-Asian influences,” says co-owner Brenna Beato. We can attest to the fact that Community Tavern does a lot to support their ideals of community involvement. It doesn’t hurt that their seasonal menus are delicious and the ambiance of the restaurant is warm and inviting. Get those stocking stuffer gift cards and treat yourself to some grub while you’re at it! Fearless Cooking, 4501 N. Milwaukee Ave.
Offer: Stocking Stuffer Special - We'll hand you a stocking when you walk in, and everything you can fit in it will be 15% off! Fill out a Courage Cash card to enter to win a $50 gift certificate! About: Fearless Cooking is currently operating a holiday pop-up full of unique, cooking-related tools and gifts including cookware, tools, gourmet foods, and cards. Their huge, sunlit space is filled of the highest-quality, expertly curated cookware and gifts. You’ll be sure to find items that mean something to everyone on your shopping list (and yourself)! frunchroom, 4042 N. Milwaukee Ave.
About: “We make 99% of the menu in-house, from scratch! That includes smoking + curing meats, culturing cheeses + sauerkraut, pickling vegetables, baking pastries, making bagels, hand tossing pizza, and more,” say Stephanie & Matt of frunchroom. They are one of the most interesting and eclectic restaurants in our area, constantly putting on food-themed events such as their Thursday Pizza Nights, which have morphed into Thursday Pizza & Pasta Nights and feature a new menu every week of handmade pizzas and pastas. Chicago Taco Authority, 4219 W. Irving Park Rd. About: While shopping for stocking stuffers, why not stop in to Chicago Taco Authority for a meal with your friends and family? Chicago Taco Authority serves traditional and gourmet tacos with a fun concept using city and transit decor! Owner Jose Bustos employs his mother as a chef in order to preserve the authenticity of the dishes he enjoyed when he was growing up. Chicago Sip & Paint, 4412 N. Milwaukee Ave.
About: “We host fun and memorable BYOB paint and sip events. Book our private room for your upcoming holiday party, corporate event, ladies night, birthday celebration, etc. and pick your own date/time, painting selection, and music playlist,” says owner Lily Miteva. Even if you think you’re a terrible artist, Sip & Paint will help you find the artist within you. It might just be the bubbly talking, but we’d like to think that the alcohol is just helping us dip into our confidence! ERIS Brewery and Ciderhouse, 4240 W. Irving Park Rd. About: “We are the first brewery and ciderhouse completely run by women in the state of Illinois,” says co-owner Michelle Foik. This giant brewery and ciderhouse offers very experimental and award-winning beers & ciders, including their interesting group of CPAs: cider pale ales, which are a specially brewed cider-IPA concoction. If that isn’t a new drinking experience, we don’t know what is! About: “We create immersive & site-specific theatre for young people and their communities,” says director Christian Libonati. Filament Theatre is not only one of our most community-involved businesses, they also constantly have the most interesting shows and interactive experiences we’ve ever seen. A ticket to one of their performances doesn’t just mean you sitting quietly in the audience, watching in silence. It more often than not means you are participating in some way, you’re laughing out loud, you’re on your feet! It’s definitely a new show-watching experience. Fannie's Cafe, 5044 W. Montrose Ave.
About: “We offer food and baked goods made from scratch that taste just like home. We’re the coziest atmosphere in town and THE place for holiday treats and gifts,” says owner Stephanie Rybandt. Everything from the piano to the dark wooden chairs to the moist muffins make Fannie’s an extension of your own home. Come by during your shopping and settle down for a nice serving of something sweet and warm.